Visiting archives to view old documents can stir strange emotions. Handling manuscripts, the historian sees not only the private words of someone else but even a physical presence: the quiver of an elderly hand, the smudge of a young thumb, the jagged strokes of impatient fingers flying across a page during a few minutes of leisure. Reading old books, likewise, the historian sees not just printed words but also their readers, folding down page corners or arguing in the margins—or, in one case I found, pressing maple leaves in the fashion pages of Harper’s Magazine. This intimacy is unpredictable, like contact with living people. Digitized sources, on the other hand, are uniquely democratic. They are available to researchers working from far away, and they lower barriers in other ways—allowing a scholar, for example, to quickly search mountains of text for a particular phrase, reducing the advantage of veterans who have spent years studying the same documents. The ease of manipulating digital sources makes it possible to study large subject populations and great periods of time. For this, we owe digital repositories a great debt. But it sometimes can be harder to feel the life in digital sources. They do not necessarily make it easy to understand the text as something fashioned and received by living people. Fortunately, however, technological power also makes it easier to study the lives of particular individuals, including people who were obscure. It can let scholars discover unexpected sources and follow narrow trails through vast quantities of information. If digitized sources are less tangible, in other words, they can also be more biographical. I discovered that part of the promise of digital sources when I began researching early African-American writing about national identity. Many of the historical figures I have encountered in the course of that research—both writers and people whose lives intersected with theirs—are difficult to know today. Most of them were relatively anonymous even while they lived. But using tools like America’s Historical Newspapers makes it far easier to understand both them and the world they inhabited. Walker would go on to publish An Appeal to the Coloured Citizens of the World, a militantly nationalistic antislavery pamphlet, the following year. His participation in the work of Freedom’s Journal provides a window into the intellectual process that led to that famous book. By tracing his thinking through these articles, we can see just how closely connected his idea of racial solidarity was with his belief that African Americans needed to develop their own middle-class literature. John Russwurm’s change of mind is an excellent example of the “messiness” of history. It shows that ideas are not static; they do not exist forever in a perfect form, but instead are part of life. The frustrations, doubts, and weaknesses of an individual can enter the history of a people. To properly understand a set of ideas, therefore, a historian needs to be able to trace them through time. Just as physical access to manuscripts makes it easier for the historian to understand the living, breathing person, so ready digital access to printed manuscripts can make it easier for her to understand the living, breathing idea. [i] Untitled (2 January 1829, p. 8). 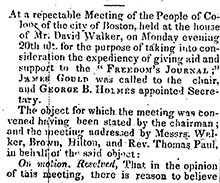 [ii] Untitled (16 March 1827, p. 3); “Freedom’s Journal” (25 April 1828, p. 6); “Address, Delivered before the General Colored Association at Boston, by David Walker” (19 December 1828, pp. 2-3). 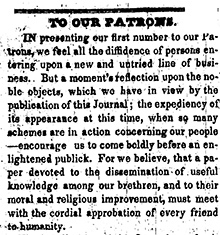 [iii] “To Our Patrons” (16 March 1827, p. 1); Investigator, “Colonization Society” (31 August 1827, p. 2); Investigator, “Colonization Society: No. I” (7 September 1827, p. 2); J. H. K., “American Colonization Society, No. I” (14 September 1827, p. 2); J. H. K., “American Colonization Society: No. II” (21 September 1827, pp. 1-2); John H. Kennedy, “American Colonization Society: No. III: Its Bearing on the Interests of the FREE People of Colour” (28 September 1827, p. 2). 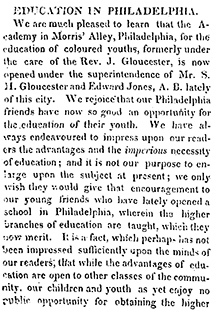 [iv] “Education in Philadelphia” (10 October 1828, p. 2). 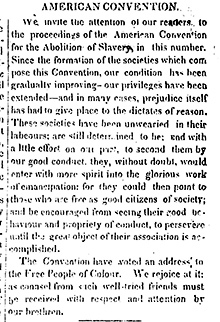 [v] “American Convention” (19 December 1828, p. 3); “The Colonization Society” (19 December 1828, p. 4). [vi] “Slavery” (2 January 1829, p. 1); “Emancipation and Colonization” (2 January 1829, p. 1); “Expedition to Liberia” (2 January 1829, p. 3); “The New Year” (2 January 1829, p. 6); “Liberia” (14 February 1829, p. 6); “Our Vindication” (7 March 1829, p. 6). As Jacqueline Bacon and Winston James have shown, Russwurm did not give up the editorship of Freedom’s Journal because of reader opposition to his new policy; his resignation was part of his plan to emigrate all along. Jonathan Wilson holds a Ph.D. in American intellectual history from Syracuse University. His research focuses on the uses of national identity in the antebellum United States. A founding contributor to The Junto: A Group Blog on Early American History, he is working on a book about nationalist literary intellectuals in New York City. He teaches history at the University of Scranton and at Marywood University.